Based in Winnersh Triangle, Berkshire we operate from a 8,750 sq ft factory fully equipped with state of the art design, assembly and testing facilities. We operate a 225m2 Class 10,000 (ISO 14644-1 Class7) clean room with ante-room for assembly with a filtered and conditioned air supply. 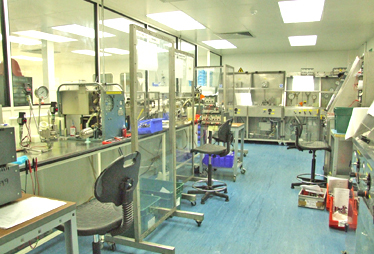 The clean room offers 3 stage ultra-sonic cleaning, fluid cleanliness monitoring, pressure testing, and extensive dedicated tooling for assembly.Flushing rigs and particle counters are used to achieve and verify the finished assemblies meet standard NAS 1638 class 6 or better. Our staff are all highly skilled, many of whom have been with the company for over 5 years and are equipped with a full compliment of safety and protective clothing. We run the Factory Master system, which is used for everything from document revision, engineering change notes, stock control, ordering, assembly, resource allocation, order processing, sales and progress reporting. We carry inhouse design and product development in accordance with client specification using the latest A-CAD software. It is Subsea Components aim to adapt to meet the market needs. This may require a new variation of an existing product or a completely new approach. For this purpose we operate two self contained high pressure test rooms with hyperbaric testing chambers rated upto 500bar. Our engineers have comprehensive knowledge of the industry and applications for our products and are constantly looking for ways to fill gaps in the market.